Exception Details: System.Web.HttpException: Unable to make the session state request to the session state server. Please ensure that the ASP.NET State service is started and that the client and server ports are the same. 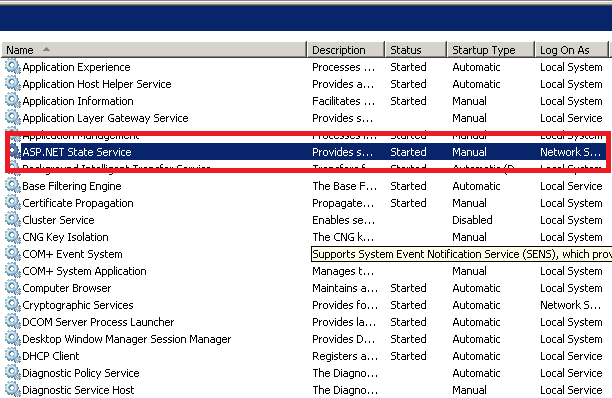 If the server is on a remote machine, please ensure that it accepts remote requests by checking the value of HKEY_LOCAL_MACHINE\SYSTEM\CurrentControlSet\Services\aspnet_state\Parameters\AllowRemoteConnection. 1. Start–> Administrative Tools –> Services. 2. ASP.NET State Service üzerine sağ tıklayıp “start” ediyoruz. web.config file ‘nızda aşağıdaki satırı kontrol etmenizi öneririm.